The days leading up to Christmas are among the busiest travel days of the year, with a record 94.5 million Americans planning to drive or fly home for the holidays, enduring heavy traffic and long delays in airports just to be close to loved-ones. But humans clearly aren't alone in their enjoyment of a little quality time with family. In this footage, captured by Parks Canada photographer Andrew Manske, a mother polar bear and her two young cubs appear to relish a tranquil, wintery moment together, rolling around and relaxing in the snowy wilds of Manitoba, near Hudson's Bay. 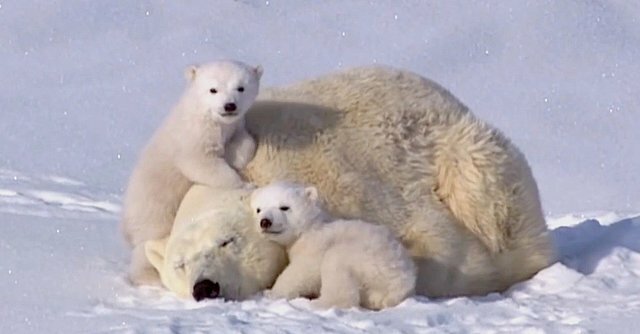 Although polar bears are generally considered to be solitary animals, they have been observed meeting together for "play fights" with other bears even into adulthood -- suggesting they have well-developed friendships born from, perhaps, moments of familial bonding like the one seen above that keep them coming back for more.